"While the inhabitants of this regions are as diverse in thought and behavior as can be imagined, in general I found them distrustful of outsiders, as they commonly believe that spies from the League of Armach are everywhere. But I found that such barriers to communication quickly melted away when I professed interest in the religion of the locals (which is easy to determine, since most people wear at least one symbol of their faith on their bodies, and often several), which inevitably lead to a lengthy theological debate. However, I recommend talking to members of your own faith first unless you have a personal interest in comparative theology or are a masochist, since they will only stop trying to convert you to their faith if you can convince them that you are one of their own. At this point, you will have made a new friend, be invited to their home, and learn how hospitable these people can be." 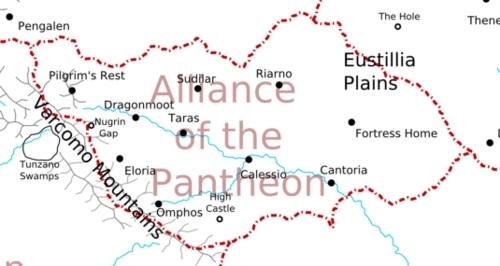 The Alliance of the Pantheon is a diverse group of cities loosely bound together against outside aggression. Shaped by refugees from Thenares who fled from religious repression by the faith of Thenos, each city has its own patron deity and its own religious laws. While Thenares is occupied with other matters, the League of Armach has proved to be an aggressive new foe and war threatens again. But will the diverse faiths of the region stand united against this threat—or will they succumb to pressures from without or within? For the most part, the Alliance remains an economic backwater when compared to the industries of most Western regions. Few major trade routes passed through its territory, and with the rise of the League of Armach, even more fell into disuse. Distrust and suspicion between the various Alliance cities often resulted in high tariffs, keeping the volume of trade low and the cities close to self-sufficient out of necessity. However, the advisers of Lord Amrast have realized that this state of affairs cannot continue if the Alliance is to come anywhere close to the production capabilities of the League of Armach. As a result, the tariffs were forcibly reduced and economic incentives were established to establish better rail network between and greater specialization in production capabilities within the cities. There has been a great deal of protest over this from established economic interests, but to no avail. The region has even seen a recent economic boom in the last year, although many of these efforts have been partially financed with loans from the Gemeinschaftsbank. The main exports of the region has traditionally been equipment and items related to the various dominant religion. This continues to this day, despite the greater economic output of the region - for much of the excess production is stockpiled for the upcoming conflict. Until recently, life in the Alliance followed a fairly leisurely pace. Daily rituals centered around one's religion were followed ardently, but such activities had long since settled into a comfortable routine which did not bother the followers. Few people had any strong desire to work hard for anything but their religion, as one's reward in the afterlife for living according to the tenets of one's faith was seen as more important than any temporal gains of material comforts. Members of other faiths were disdained, but since everyone tended to keep to their own affairs, actual conflicts were few. With the looming war with the League of Armach and the installment of a War Leader for the Alliance, things have changed. Members of different faiths now have to interact more often in order to integrate both the military and the economy of the Alliance, and as a result tempers are on the rise. It doesn't help that League spies and saboteurs are common, and the frequent denouncement of members of different faiths as such doesn't help. On the other hand, many young people - especially those who have been impressed by the speeches of Lord Amrast - have embraced a new spirit of openness. They look forward to getting out of their home city and seeing the wider world, and they actively look forward to talking to members of different faiths. While most still feel more comfortable with their own faith, others have actually converted to different religions - while some have grown somewhat disillusioned with religion in general and feel that they do little other than driving people apart. Traditionally, each city has managed its own affairs and protected its independence fiercely. However, whenever the Alliance is threatened by an outside force, the city-states of the Alliance can choose to call for the establishment of the Alliance Council, which consists of representatives of each of the major cities of the Alliance, and which in turn can elect a War Leader for the Alliance. The War Leader has broad powers to draw upon the resources of the member cities - military or otherwise - to defend the Alliance against its enemies. However, the Alliance Council can place restrictions on his powers or overrule his decisions with a simple majority vote, and in the end, there is nothing that prevents a city from simply walking out of the Council and the Alliance if it feels that continuing to be a member is no longer in its interest. Thus, while the legal restrictions on the War Leader are few, the political restrictions are very real and must not be ignored. As should be expected from a region founded by religious refugees, the people of the Alliance of the Pantheon are among the most devout in the Known Lands. Followers from almost every faith can be easily found. However, most followers of a certain cult tend to congregate together, usually in a particular city-state, and they tend to make members of different religions feel unwelcome. Actual persecution is rare (since few want to reenact the Thenaran crusades), but social snubbing and prejudice are common. The region now known as the Alliance of the Pantheon always was a backwater when compared to the larger nations of the world. Primitive tribes of humans and hobgoblins lived here before they were gradually absorbed into the Atalan Empire, and even then the rulers of the Empire always saw this province more of a necessary annoyance which had to be kept clear of the numerous bandits so that the caravans could travel to more interesting and profitable places further east. For a time, it served as a haven for dissidents and exiles who wanted to get away from the intrigues of Atalus, yet still live within the protection of the Empire. During the wars with the dragons of the Desert of Thunder, attacks on this province caused the collapse of any central authority, and it never recovered when the Atalan Empire crumbled soon afterwards. Various tribes of hobgoblins vied for supremacy in the region and built their own petty kingdoms, but all they managed to do was keep their population in check. The beginnings of the Alliance itself can be traced back to the 11th century NA, when the theocracy of Thenares was first established. When the persecution of non-members of the Church of Thenos became more and more heavy-handed, many fled south to the poor villages and cities of the region. The shared experience didn't get the refugees from different religions to cooperate, however—if anything, they grew more fractious and squabbled over resources. This came to an end in 1104 NA when the leaders of Thenares called for a crusade to expand the realm by force of arm and "purge the world of unbelievers". The various religious leaders finally hammered out a peace agreement between their faiths and cities and set out to defend their new homes against their common foe. They managed to first slow the invasion forces down and then stop them, establishing the modern borders between Thenares and the Alliance. Centuries passed, and Thenares renounced its former military adventurism and turned its attention to other matters, such as the expanding Hobgoblin Dominions to the north. The bonds of the Alliance waned, and the city-states returned to their usual disputes—though outright warfare remained rare. But in recent years, a new foe appeared on the scene—the League of Armach. Their territory expanded further and further west and approached the territory of the Alliance. The leaders of the Alliance cites debated endlessly, but could not agree on a common course, much less who among should lead them. No doubt this discord was encouraged by League agents. Matters came to a head two years ago, when a "rogue" League military unit "accidentally" moved over the Eustilia Plains into Alliance territory. They were throughly defeated by Lord Amrast, a famous paladin, his followers, and a large number of irregular centaur troops. This victory gave Lord Amrast an enormous following among the population and was chosen by popular acclaim to lead the Alliance in this time of crisis. However, not all people in the Alliance are happy about this, for Amrast is a paladin of Thenos—and while he has pledged to respect and protect the faiths of the region, many priests trust no member of that religion, and some have started to plot in secret to remove him. Many adventures in the Alliance of the Pantheon will revolve around the conflict with The League of Armach. Both sides are hiring mercenaries and spies, and there are always some dastardly saboteurs to foil. And the Alliance itself is far from unified in the face of this threat—centuries of mutual suspicion and cultural differences cannot be overcome overnight, and there are frequent disagreements about the division of power, funds, and labor in the war effort. The religions that founded the Alliance also provide sources of adventure, for the close proximity of passionately religious people of different faiths frequently leads to conflicts—to say nothing of sectarian conflicts within any given faith! Top-level diplomacy: Various representatives of the Alliance meet in secret with members of several dissident groups in the High Castle in order to agree on a common strategy against the League government. But any of the participants could be a spy for the League, and trust is in short supply. The PCs are either among the entourage of one of the representatives or (if they have established their own power base in either the Alliance or the League are representatives in their own right. When one of the delegates is murdered in his own room, they must figure out the perpetrator (who could be hiding among either the delegates or the Guldenberg staff) before the meeting breaks down entirely. Older secrets from the past of the High Castle might provide further complications. Web of Lies: The PCs come across evidence that a member of the Alliance Council is secretly a traitor working for the League of Armach. Soon after finding the documents, they are stalked by a variety of assassins who want to kill them and thieves who want to steal or destroy the evidence. Will they find anyone who will believe their evidence if they go public with it, or will they be accused of fermenting distrust within the Council? And is the evidence actually genuine, or has it been planted to cast doubt on a dedicated member of the Council? Dungeons & Dragons traditionally has a very polytheist approach to religion. I wanted to create a region where I could explore this aspect fully, and the Alliance of the Pantheon was born - a region full of religious diversity, with all of the advantages and disadvantages this implies. What's more, the Alliance represents the closest thing to the "Good Guys" that you will find in the Known Lands - they are the Rebel Alliance to the Imperium of the League of Armach. Of course, this doesn't mean that they don't have internal divisions of their own - to the contrary. But the Alliance must either learn to hang together or end up hanging separately.